Jeremy Adams, owner of Prestige Food Trucks in Florida, joins me on the podcast today to share what to look for in a reputable food truck manufacturer. While most manufacturers that have been in business longterm produce a high-quality final product there are horror stories from entrepreneurs like this couple from Portland that wrote a check for about $10,000 then the builder stopped answering the phone. After further investigation, it was discovered that this builder had duped other Portland area entrepreneurs as well. While the above example is likely the exception, it’s important to conduct your due diligence on any builder prior to putting down a hefty down payment. In addition to discussing what to look for in a qualified manufacturer, Jeremy dives deep into the characteristics of successful food truckers, the importance of reliable electrical equipment and generators, in addition to the future trajectory of the street food movement and the importance of developing a unique brand. 1.) Contact previous customers of the manufacturer and see their previous work. 2.) Ask about how the truck was when it was time to pick it up. 3.) What was the service after the sale like? After you paid the money and drove off is the company still returning your phone calls and answering any follow-up questions you might have. This is critical because you will have questions after the final sale. Take the time to listen to what past customers have said. These are the people that will be the most honest and have the most reliable feedback about a manufacturer. Another easy action you should take during the evaluation process is to check out the manufacturers website. Here you can typically find photos of trucks that have been built in the past. Often you can find out the name of the food trucks that have been built previously from the website. From there you can do some additional Google searching to get in contact with past customers. They’re just genuinely humble people. Because to work in a restaurant, whether you’re front of the house or back of the house, it’s a very humbling job. It’s a certain mindset that gets into the industry in the first place. – Jeremy Adams on personality characteristics of food truckers. They have just an ultimate understanding of the restaurant industry. They understand customer service. I don’t think that they need to be experts in any particular field, but they have to a good overall understanding. They have to be able to manage their finances. They have to be able to do a little bit of marketing. They have to be able to have a little bit of cooking experience. They have to be well-rounded in my opinion. – Jeremy Adams on successful food truck entrepreneurs. The critical questions you need to ask a food truck builder prior to signing on the dotted line. To build a truck you need mechanical, metal fabrication, plumbing, and electrical skills. That’s a lot of skillets for anyone person to have making it difficult to manufacture a food truck yourself. The traits you need to master to improve your chances of mobile food success. Jeremy Adams shares his outlook and perspective on the future of the industry. Prestige Food Trucks – Jeremy Adams and Prestige have been manufacturing quality food trucks for roughly two years now. They clearly stand behind the vehicles they produce and list numerous examples of the food trucks they’ve produce in the past, including contact information for past clients. 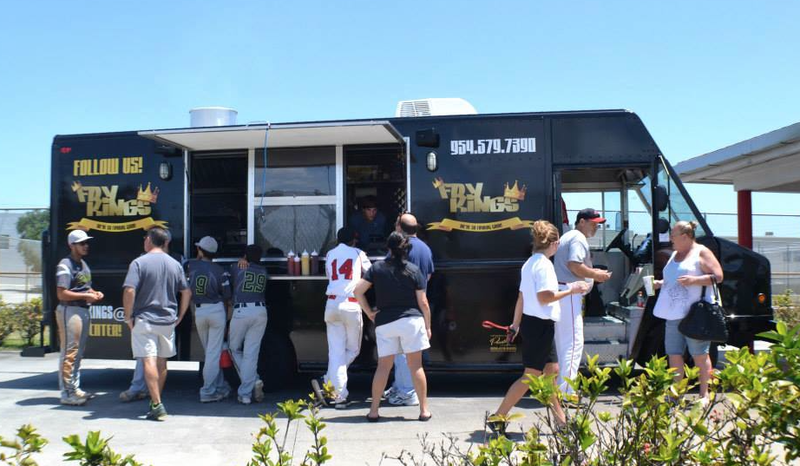 Fry Kings – Mentioned during the podcast, this is one of the vehicles that was produced by Prestige Food Trucks. You can find Fry Kings rolling the streets of Coconut Creek, Florida, and the surrounding area. VooDoo Kitchen Food Truck – This vehicle was also developed by Jeremy Adam’s company and referenced during the program. Judging from the VooDoo kitchens extremely busy schedule this summer their unique take on Louisiana faire is making them very popular in the Orlando area. Dunkin’ Donuts Food Truck – Prestige also manufactured the popular Dunkin’ Donuts franchise truck. If you’re like me and don’t have a location nearby yet, this is a more convenient way to get one of their awesome iced coffees. DYI Food Truck Design – If you liked this episode, check out our previous interview with Jeremy Campeau on how to build a food truck yourself. Local news report featuring Prestige Food Trucks and Voodoo Kitchen.